The magician lets his spectators examine a red plastic ball and a clear plastic box. One spectator sets the ball inside the box, which the magician refers to as the "Disintegration Chamber." 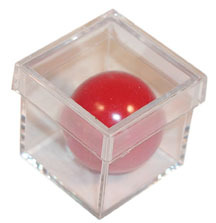 Despite the fact that the lid has been placed on the Disintegration Chamber and the spectators have examined all of the props, the ball manages to vanish from inside of the box at the magician's command. Covered by a handkerchief, the ball simply melts away!